NEW YORK (CNNMoney.com) -- The Nissan Leaf electric car will get the equivalent of 99 miles per gallon according to its official EPA fuel economy label rating. Since the Leaf uses electricity and not gasoline for fuel, the EPA had to create an "mpg-equivalent" rating. Ninety-nine miles a gallon would make the Leaf the most efficient mid-sized car on the market. The Leaf is expected to get 106 mpg-e in city driving and 92 on the highway. Electric cars commonly get better mileage in city driving where the brakes, which help recharge the battery, are used regularly. The EPA estimates the Leaf's driving range on a full charge to be about 73 miles, according to the label provided by Nissan, a figure that is considerably lower than the 100 miles Nissan has regularly touted for the car. The annual electricity cost for the Leaf is estimated to be $561. By comparison, the annual fuel cost of a Toyota Prius, which the EPA estimates gets 50 miles a gallon, is $867. The Leaf is also officially rated as producing no greenhouse gases and has the best possible ratings for other pollutants. EPA ratings measure only pollutants produced by the car itself, not those produced outside the car by power plants, gasoline refineries or other sources. Nissan will begin selling the Leaf in a limited number of U.S. markets in December. 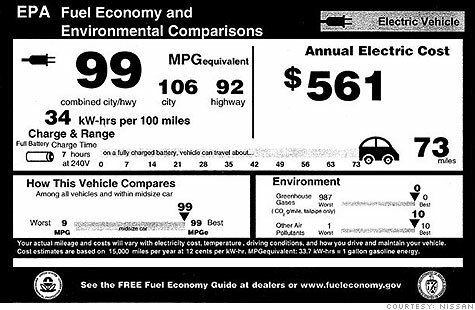 Cars cannot be sold in the U.S. without an EPA fuel economy label. General Motors is awaiting a decision by the EPA on how it will rate the fuel economy of the Chevrolet Volt. The Volt's fuel economy is a more complex issue since that car runs on battery-stored electricity for about 40 miles before using power from a gasoline engine. For that reason, the car's actual fuel economy will vary greatly depending on how far it is driven before its batteries are recharged.